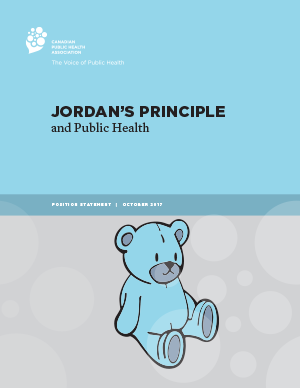 The Canadian Public Health Association supports Jordan’s Principle, and calls on the federal, provincial and territorial governments to fully implement the Principle and address inter-jurisdictional disputes related to the provision of health and social services and/or supports to First Nations’ children. Facilitate access to health and social services/ supports to all First Nations children without delay or disruption. The underlying situation that gave rise to this principle was unsupportable from both health equity and social justice perspectives, and represents an example of structural violence, whereby disagreements over jurisdictional responsibility led to harm to a child. 1 The fact that Jordan could only receive these services after being put into the child welfare system, rather than going home, is an additional injustice about his story. Thus, Jordan’s Principle is also about ensuring First Nations children and youth have access to the services they need at home. 2 The Jordan’s Principle Working Group 2015. Without Denial, Delay or Disruption: Ensuring First Nations Children’s Access to Equitable Services through Jordan’s Principle. Ottawa: ON. Assembly of First Nations. 3 House of Commons, 2007. Private Members Motion 29, December 12, 2007. 4 Truth and Reconciliation Commission, 2015. Calls for Action, Indian Residential Schools Truth and Reconciliation Commission. Ottawa, ON. 5 Assembly of First Nations v. Attorney General of Canada. Canadian Human Rights Tribunal 2016 CHRT 2, January 26, 2016. 6 First Nations Child and Family Caring Society of Canada, et al. v. Attorney General of Canada. Canadian Human Rights Tribunal 2017 CHRT 14, May 26, 2017.